The orange fruit is a food staple that can be found in almost every house and local market around the world. The sweet variety is the most common one, and it brings much more to the table than just vitamin C.
Hailing from Asia, the tasty, juicy orange fruit is now cultivated around the world, mainly in subtropical climates, not only for its delicious flavor and nutritional content, but also for its medicinal value. Learn more about the many health benefits of oranges, their history and how to consume these citrus fruits. Preventing cellular damage. Like most fruits, oranges have an antioxidant action, hindering free radicals that destroy the cells, fighting harmful bacteria and viruses, and helping prevent degenerative diseases. Reducing inflammation. Consumed in their natural form, without any additives, oranges have been associated with an important reduction of severe inflammatory conditions, like asthma, osteoarthritis, and rheumatoid arthritis. Improving cardiovascular health. Many scientific studies have shown the beneficial effects of consuming oranges on the treatment and prevention of cardiovascular diseases. Helping digestion. Due to their high fiber content, oranges also work wonders for the digestive system, regulating intestinal transit and preventing constipation. 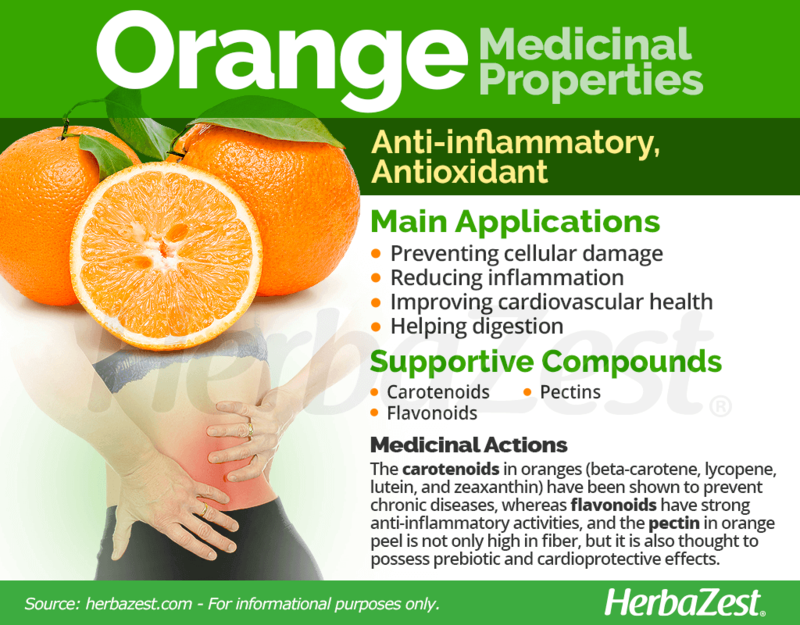 Additionally, the antioxidant activity of orange's compounds has been linked to a reduction in the development of atherosclerosis, and the citrus fruit also possess antimicrobial properties. Oranges are a powerhouse of phenolic compounds, including flavonoids and pectins. The main flavonoids found in citrus species - hesperidine, narirutin, naringin, and eriocitrin - appear to be responsible for the anti-inflammatory activities of oranges and other citrus fruits. As well as other brightly colored fruits and vegetables, the orange fruit is rich in carotenoids, which are natural pigments with great antioxidant properties. The functional properties of carotenoids (including beta-carotene, lycopene, lutein, and zeaxanthin) have been extensively studied and shown to prevent several major chronic diseases. Carotenoids play an important role in protecting cells from oxidation and free radicals' damage. Pectin is a complex carbohydrate found in the peel of oranges and other citrus fruits. As a food additive, it is commonly used to thicken jellies and fruit fillings for pies and other desserts. Scientific studies have found that pectin is high in fiber and possess a potential prebiotic effect, as well as the ability of lowering LDL cholesterol, which can lead to cardiovascular benefits. A relationship between fresh orange consumption and respiratory function, in both children and adults, has been also established, although is not clear whether childhood dietary habits have some influence in adulthood. Orange extract seems to have also antithyroidal and hypoglycemic properties, which might potentially aid both thyroid disorders and diabetes, although further studies are necessary. The sugar content in oranges is composed by fructose, glucose, and sucrose, best-known as 'simple carbohydrates'. However, contrary to popular belief, oranges have a low glycemic index (GI 40), which doesn't greatly differ from other low-carb fruits, such as apples (GI 39), strawberries (GI 41), and peaches (GI 42). However, in order to avoid sugar spikes it is recommended to consume orange juice with pulp, which is full of fiber that slows down glucose absorption. THE POPULAR MYTH THAT ORANGES CAN IMPROVE COGNITIVE FUNCTION HAS BEEN DEBUNKED. THERE'S NO CONCLUSIVE EVIDENCE ABOUT ORANGE FLAVONOIDS' EFFECTS ON BRAIN POWER. Other herbs with great immune boosting, antioxidant properties are bell pepper, camu camu, and lemon, whereas cabbage, devil's claw, and turmeric also provide anti-inflammatory benefits. Orange is a very healthy fruit, and its is considered generally safe for consumption, but excessive intake can lead to some uncomfortable symptoms, like abdominal cramps and diarrhea. It's common knowledge that most of the benefits of orange are due to its outstanding levels of vitamin C (ascorbic acid). This water soluble nutrient is crucial for the proper functioning of the immune system, as well as for preventing colds, cough, and recurrent ear infections. 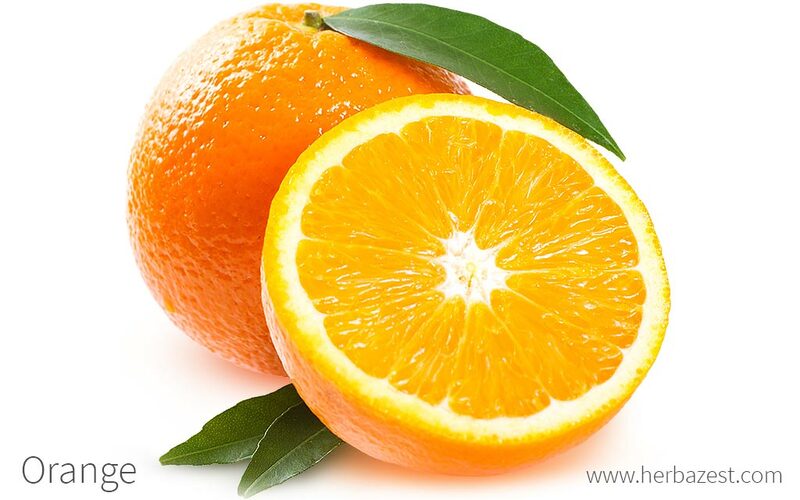 However, the orange fruit is also rich in dietary fiber, and provides good amounts of B complex vitamins, mainly B1 (thiamin), B5 (panthotenic acid), B6 (pyroxidine), and B9 (folate). These vitamins play an important role in cellular regeneration and proper brain functioning, as well as in energy production. For this reason, oranges are highly recommended during pregnancy in order to ensure a healthy development of the fetus and prevent any birth defects. Other essential nutrients, present in small amount in oranges are B2 (riboflavin), B3 (niacin) y choline, as well as vitamins A (through carotene) and E (alpha-tocopherol). Additionally, the orange fruit is an adequate source of some important minerals, such as potassium and copper, which are necessary for blood pressure regulation and red blood cells production, respectively. The nutritional value of orange is rounded by small amounts of calcium and magnesium, among other minerals. 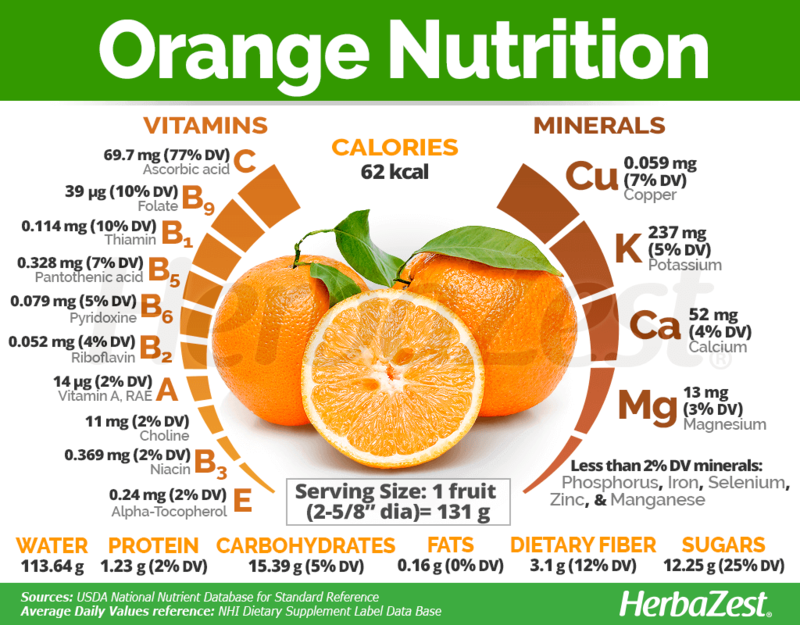 One medium sized orange (131 g) provides only 62 calories, as well as 5% and 12% of the recommended daily value for carbohydrates and dietary fiber, respectively. Oranges have a myriad of culinary uses. Their juice can be added to sauces as well as used as an ingredient for many savory and sweet dishes. 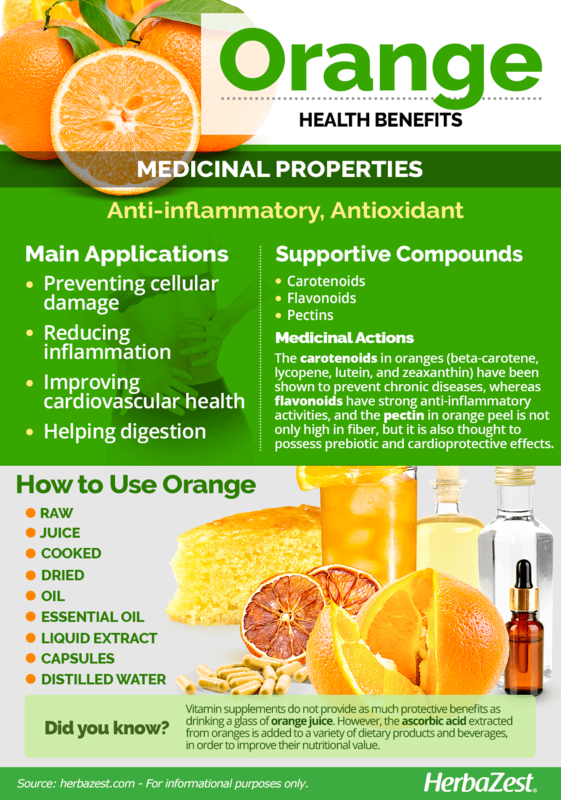 While orange benefits are better reaped from its natural state, a number of remedial forms exist and can be used to take advantage of the medicinal properties of this citrus fruit. Raw. Fresh oranges can be eaten in their natural state. Cooked. Both the peel and the juicy flesh of oranges are used also to prepare jams, cookies, cakes, candies, and baked goods. Juice. Oranges are a widely preferred choice for breakfast juice, in both fresh or processed forms. For a healthy dose of fiber, it is better to drink orange juice including the pulp of the fruit. Dried. Orange flesh and peel can be dried and used as a healthy snack or an ingredient for desserts. Oil. Not as popular as other types of oils, orange seed oil can also be used in cooking. Vitamin supplements do not provide as much protective benefits as drinking a glass of orange juice. Essential oil. Sweet orange essential oil can be used topically for skin rejuvenation, as well as for relieving eczema, dermatitis, and other skin conditions. It is also popularly used in aromatherapy for reducing fatigue, palpitations, premenstrual tension, menopause symptoms, and stress. Bitter orange essential oil is commonly used for treating acne and wounds. Both oils can soothe anxiety and help treating insomnia. Liquid extract. This non-alcoholic, concentrated solution is obtained from the peel of sweet oranges and it has been traditionally used for relieving indigestion and nausea, but it also possess antimicrobial properties that are currently used to treat fungal infections and other skin problems. Distilled water. The orange flowers are processed to obtain a liquid with a subtle floral flavor, better known as 'orange blossom water'. This preparation has been traditionally used to flavor some Arabic desserts, as well as for calming the nerves and treating insomnia. Capsules. Sweet oranges are rich in vitamin C (ascorbic acid), which is isolated and consumed as a daily supplement, in standardized doses due to its anti-inflammatory, antioxidant, and immune boosting properties. The ascorbic acid extracted from oranges is added to soda and cocktail drinks, punches, and even liqueurs. Whether locally grown or imported for different countries, oranges are ubiquitous all over the world, and many varieties and cultivars are available for purchase in local markets, supermarkets, and organic stores. Orange oil for cooking purposes is not as common but can be purchased from online retailers, as well as from specialized food stores. Orange seeds and seedlings can be commonly found in plant nurseries and garden supply stores. Medicinal preparations of bitter or sweet oranges, such as liquid extracts an essential oils, can be found in specialized herbal stores and can also be purchased online. 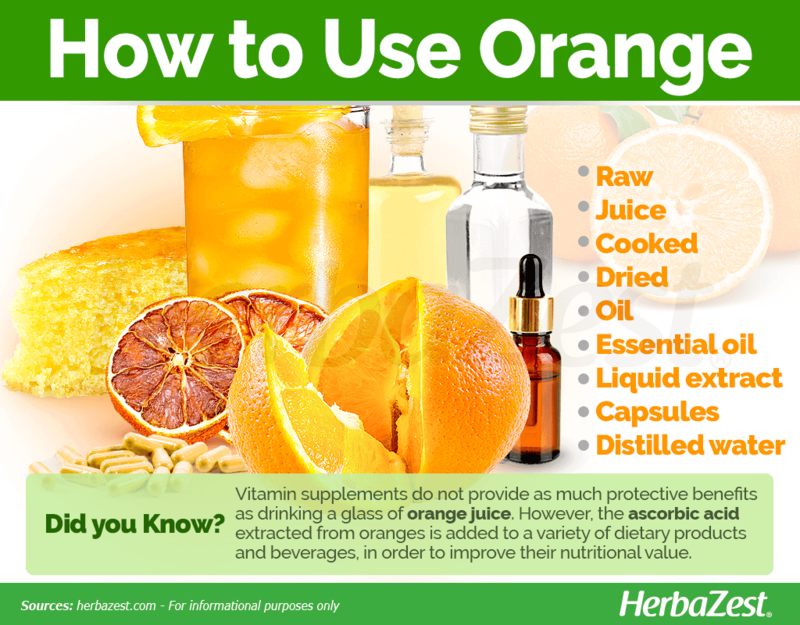 Orange supplements can be found in different forms, from chewable gums to capsules, in most over-the-counter sections of drugstores and supermarkets, as well as in health stores. Orange trees can grow to a height of 16 - 49 feet (6 - 15 m) and live for periods of more than 100 years. Orange is a subtropical species, so this trees grows best in warm regions with a pronounced change in season. The ideal range of temperature for oranges is between 55 - 100°F (13 - 38°C) during the growing season, and 35 - 50°F (2 - 10°C) during dormancy. While mature orange trees may be able to survive short periods of freezing, young trees will be killed, so they need to be protected from extreme weather. The orange plant prefers well-drained, sandy loam soils, with a pH between 6.0 and 7.5. The young orange trees require soils deep enough to allow for adequate root development. Being subtropical trees, oranges require full sun, as well as protection from the wind in order to prevent damage. Preferred annual precipitation ranges from 5 - 20 inches (130 - 500 mm), though oranges are frequently grown in areas receiving 40 - 60 inches (1,000 - 1,500 mm). Although oranges can be grown from seeds, the most common form of reproduction is by budding onto appropriate root-stocks. Orange blossoms yield very little pollen, but orange growers do not practice artificial pollination except in the case of hybrids, where honeybees are mostly used for cross-pollination. Common distances between orange trees go from 20 - 25 feet (6 - 7.5 m) to 10 - 15 feet (3 - 4.5 m), depending on the area covered by the crop. Close-spacing requires expensive pruning, and affects negatively the production. The sweet orange tree is an evergreen, branched with a rounded crown and oval leaves that are alternately arranged on the branches and have slightly feathered petioles. Its white flowers can bloom individually or gathered in a group. The orange fruit is a spherical berry with a green-yellow to orange skin and segmented, pulpy flesh with several seeds. Botanically known as Citrus sinensis, orange belongs to the Rutaceae family, which comprises over 900 species across 150 genera, including economically important citrus fruits such as lemon (Citrus limon), lime (Citrus aurantiifolia), and grapefruit (Citrus paradisi), along with medicinal herbs like rue (Ruta graveolens). Most of the oranges grown in the U.S. come from California and Florida.The first uses two cultivars, 'Washington Navel' and 'Valencia', while Florida's commercial cultivars are mainly 'Hamlin', 'Pineapple', and 'Valencia'. In Brazil, the biggest producer of oranges, major cultivars include the late ripening 'Pera', 'Natal', and 'Valencia'. Together, they account for about 70% of orange production. They supply fruits from June to December, and in smaller amounts up to March of the following year. The ripening season for early varieties, like 'Bahia' and 'Baianinha' navels, goes from March through June. The orange tree is thought to be native to southern China, northeastern India, and perhaps southeastern Asia. Historical data indicates that oranges were probably introduced to the Mediterranean area by Italian or Portuguese traders around 1450-1500. Citrus fruits were highly regarded by Europeans, mainly for medicinal purposes, but the orange was quickly adopted as a succulent fruit by wealthy people, and it was grown in private conservatories called orangeries. The Spaniards brought the orange fruit to South America and Mexico in the mid-1500s and it is thought that the French introduce it to North America. Citrus sinensis is one of the most important and widely grown fruit crop, with total global production reported to be around 120 million tons. The orange fruit is cultivated in more than 130 countries, including Brazil, the U.S., India, the U.K., France, Germany, Holland, China, and Spain. In worldwide trade, citrus fruits generate about $105 billion USD annually all over the world. Brazil is the leading producer of oranges, followed by the United States. During the Victorian times, it was popular for brides to carry fresh orange blossoms, even as wreaths attached to their veils, as a symbol of love and future prosperity. In the Chinese culture, the orange is a symbol of good luck. Aromatherapy. Orange essential oil is used in aromatherapy for relaxation. Cosmetic industry. The essential oil extracted from oranges' peels, flowers, leaves, and twigs have aromatic properties that are used in cosmetics, perfumes, creams, and soaps. Pharmaceutical industry. The volatile oils extracted from sweet oranges are used in pharmaceutical products for their antibacterial properties. Beverage industry. The ascorbic acid of oranges is added to many commercial beverages with the purpose of enriching their nutritional value. Honey production. Orange blossoms produce more nectar than any other source in the U.S., and are important for honey production - more than 25% of honey produced in California is from orange groves. Industrial uses. The orange peel is also used as a component in plastics, in cleaning products, and powdered for dietary and sports supplements. Texas A&M Agrilife Extension, Pectin: Health ingredient of the future?